Hey, if there's one thing everyone likes, it's gravity... and nobody knows that better than John Watson, the developer behind Gravity Ace. There aren't a whole lot of gravity-based spaceship games on the market, but there have been a few standout examples over the years, including the seminal classic Gravitar, along with classics like Thrust and Oids, and a few modern takes on the genre, including the Gravitron and PixelJunk Shooter series. 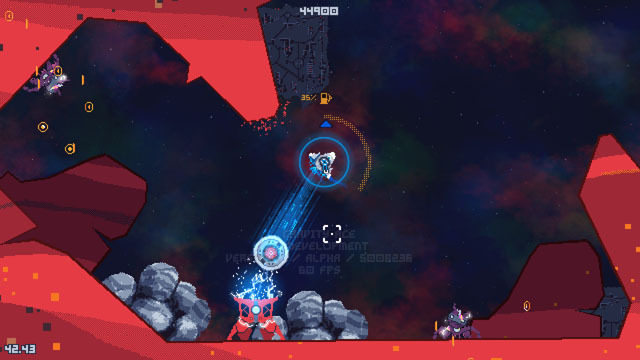 Of all these games, Gravity Ace seems to most closely mix elements from Thrust and the PixelJunk Shooter series. Like Thrust, you must descend into caverns, taking out dangers along the way, and retrieving a reactor core from deep within... and then fight to escape the planetoid's gravity in time. Whereas Thrust was a fairly slow and methodical experience (but still harrowing, mind), the PixelJunk Shooter series is more fast-paced, features much more shooting, and the need to rescue stranded astronauts. In the end, the game borrows from its predecessors but definitely stands on its own, offering a chunky explosion-heavy world with the ever-present danger of smashing into a wall of rock and meeting your untimely demise. The game offers multiple interconnected levels across three worlds and even some boss encounters to spice things up. The game is coming to PC, Mac, and Linux via Steam and Itch.io later this year.